If you have shopped for or used sphagnum moss in the past, you may have found yourself confused by the various claims and descriptions found in the market. The reality is, there are approximately 120 species of sphagnum moss found throughout the world. The physical characteristics and intrinsic qualities (i.e. chemical properties) of these different species can vary greatly. Characteristics of sphagnum moss that are of interest to most users include color, strand length, strand strength and durability, salt accumulation and chemical properties. One of the most important things to remember when comparing and choosing sphagnum moss is that different species grow in different regions around the globe. So it is important to understand which species are most likely to come from which regions. 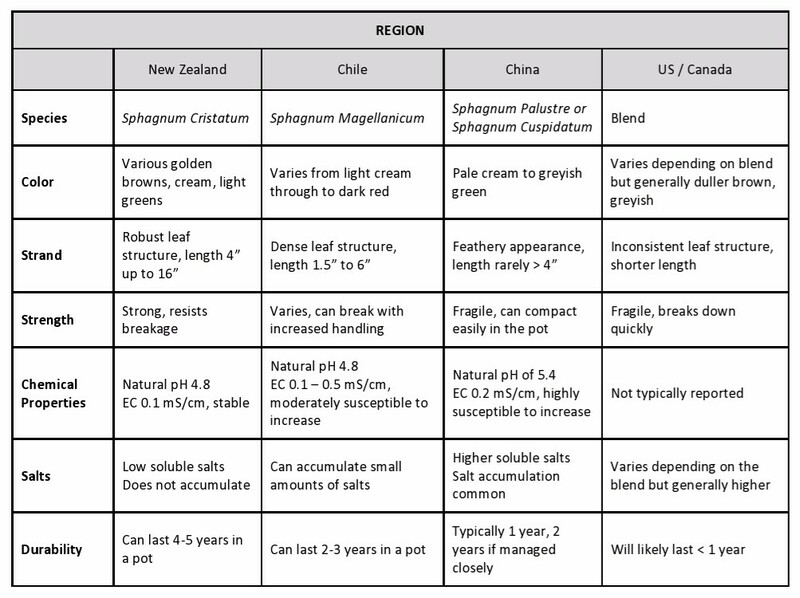 The table below outlines some of the more popular species on the market today along with a comparative summary of their key characteristics and qualities. EC = electrical conductivity in milliSiemens / centimeter. EC is a measure of salinity, a factor that influences a plant’s ability to absorb water and nutrients. As salts accumulate and moss breaks down, EC rises and begins to negatively impact the health of the plant. The best advice – take a few moments to understand the characteristics of the species being offered. That way, you will be able to accurately determine the quality of product that best meets your needs and expectations.